Empennage has been completed. Working on the wings. I ordered the RV-8 preview plans from Vans along the Les Bourne RV Builder Basics DVD (Volume 1) for $89.00. I ordered the RV Training Project and Toolbox Kit Practice Project from Vans for $63.00. The preview plans arrived today, but it was right as Nico and I were leaving to visit the Hiller Aviation Museum. Later in the evening after the boy went to sleep I opened the box and began reading the plans. I was thinking to myself: What the hell have I gotten myself into. The preview plans are a bound book of a few hundred 11" x 17" pages. Except for the diagrams in the back, most of the pages are two 8.5" x 11" format pages printed on one sheet of 11" x 17" paper. That’s kind of annoying because it means I can’t easily scan them with the ScanSnap for iPad viewing. I ordered a Craftsman Model 21400 10" Band Saw from Sears for $277.53. I spent 3.5 hours at Home Depot gathering supplies to build an EAA 1000 Work Table. I spent $578.45. About half of the cost was the Dewalt DW745 10" table saw, the rest was the wood and incidentals. I also ordered the 3M Peltor X-Series Over-the-Head Earmuffs from Amazon for $28.30. I spent about two hours setting up my new table saw, cleaning up the workshop, and cutting about half of the wood to the right sizes. I spent about an hour cutting the rest of the wood and began the sanding. I spent about an hour drilling and screwing together the top frame. I spent about an hour attaching the plywood to the top frame and attached the legs to the frame. It looks like a table now. Unfortunately I couldn’t finish it because my 4" clamps weren’t large enough. I then spent $39.94 on Amazon buying two 6" clamps. I finished the work bench and arranged the workshop. It took about an hour. Baby Marco was born early this morning so obviously I won’t be driving rivets for a couple of months. I’ve ordered the empennage kit. They are making some changes to it (probably due to SB 14-01-31 and SB 14-02-05) so there will be a bit of a delay. I ended up ordering it with the electric trim option. This wasn’t an easy decision because I’ve always thought that manual trim worked better. With manual trim feeling the resistance can get you to an accurate trim quickly. But I also like the idea of having all important buttons on the Infinity Grip Control Stick. My brother Claudio and I took the Synergy Air Fundamentals of Building class. Total cost for the two of us was $300. 8 hours. 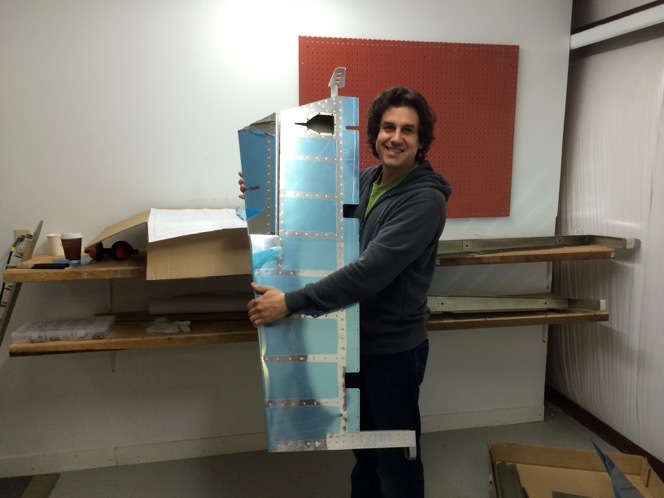 I decided to start the build by taking the Synergy Air Quick Start Empennage class. The class cost $1825. Claudio and I started in earnest on the empennage. We completed almost the entire rudder. The only thing left to do were the installation counterweights and the bending and riveting of the leading edge. We also had time to add all of the stiffeners to the elevators. 8 hours. We spent most of the day on the elevators and trim tab. We shaped and installed of the counter weights on the rudder and elevators. There was also a little time at the end of the day to match drill the vertical stabilizer spar. 8 hours. We attached the trim tab to the left elevator and bent the leading edges on the rudder and elevators. We riveted together the vertical stabilizer spars and ribs and riveted the structure to the skin. 8 hours. We finished vertical stabilizer. We finished most of the horizontal stabilizer, only the back and sides of the skins needed to be riveted along with the inside ribs. 8 hours. By strategically not riveting in a few places and getting an arm deep into the horizontal stabilizer with a tungsten bucking bar we were able to drive real rivets in a couple places that called for pop rivets. After that we closed everything up and had a completed empennage. 3 hours. It’s really amazing what you can accomplish when two people are working full time, both fully commited to the project, and with addition of a highly experienced builder around the corner to answer any questions. Most tasks were either accomplished in half the time because they were embarrassingly parallel tasks or in less than half the time because both Claudio and I broke a single task into something like a dance, with one of us riveting while the other positioned the part. And the experienced builder helps us understand the next steps in the plans or how to fix our mistakes. 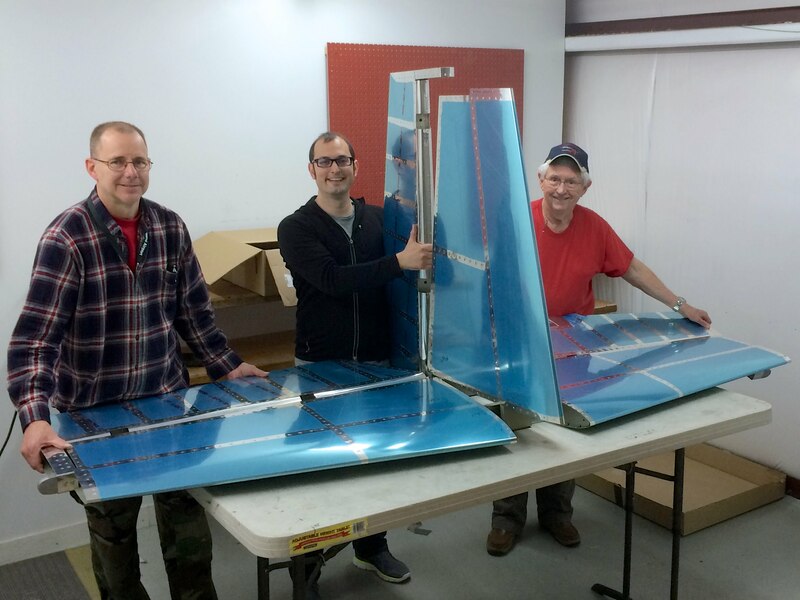 After completing my empennage someone from Synergy Air drove it to Van’s for crating and shipping. I was charged $50 for this. My empennage then sat in the Van’s warehouse for nine months before I had the mental capacity to deal with having it crated and shipped to me. I just received it. Van’s chaged me $100 to have it crated and the shipper charged me $229 to deliver it to my garage. The crate dimensions were: 102" x 39" x 20". I just sent in the order for the wings. I had originally planned on doing the Quick Build option for everything but it turns out that I really enjoy squeezing rivets. So I ordered the slow build. It was $7475 for the wing kit and $85 for crating. I just ordered my tools from Isham. I went with the RV tool kit with the tungsten bucking bar and the Sioux drill. It was $2,748 plus $86.80 for shipping. I just ordered the California Air Tools CAT-10020 Air Compressor for $433.81 and a Goodyear rubber hose for $21.44. The air compressor was something I was nervous about ordering. There are people out there that swear you shouldn’t get anything less than an 80 gallon tank. However others say they built an entire plane with a 3 gallon tank. Still others (though rare) say they’ve used electric for everything, no air compressor. I decided on a model that from all reviews was very quiet, my main concern. It happens to have a 10 gallon tank. After setting up my air compressor I can report that it is indeed pretty quiet. I’ve heard other air compressors and this one is much quieter. It’s pretty easy to have a conversation while it’s running and nobody can hear it outside of the garage. I just took possession of the wing kit. It came in two large crates. I had the time tonight to inventory one of the crates. It’s pretty amazing how they pack those things up. 2 hours. The started inventorying the second crate. 1 hour. I finished inventorying everything large in the second crate. The only thing left to inventory is the heavy bag of rivets and other hardware. I was amazed at how massive the main wing spars were. It was a little shocking how large the wings were going to be compared to my small garage. 1 hour. 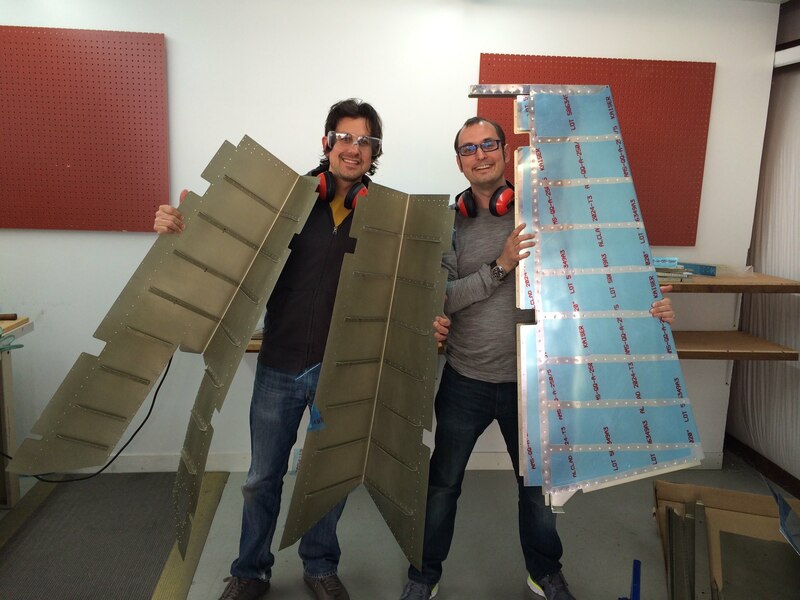 Eugene, a fellow member of EAA 338, came over last night to help me start the build. For some odd reason Van’s wants us to do put countersink holes in the wings as the first step. They are on crazy pills. Instead we started working on deburring the ribs. It was nice to finally start real work on the wings. 2 hours. Deburred ribs. Need mechanical help. Ordered a Dremel 3000 from Amazon for $75.21. 1 hour. Deburred ribs. 1 hour. All of the middle ribs are now deburred everywhere except the small spaces too small for my hands. Deburred ribs. Eugene came by and we got out the left main spar and tried to orient ourselves in order to figure out what needed to be done. It took a while to understand the drawings. We found the correct nut plates and bolts and figured out what was going to be happening. I bought some scrap aluminum from Aircraft Spruce to practice on. We drilled some holes and did some countersinking. We didn’t do any real work, but we now know exactly what needs to be done next. It felt really good to get to this point. This is the real thing. 2 hours. The idea of drilling into that expensive main spar has been scaring me away from the project but I finally got enough courage today. I re-read the plans over and over and found that he had been read too far and looking at the wrong part. There are only two sentences that describe the first part. Two sentences! Two sentences for a hell of a lot of work. I tested out what I was going to do on the scrap aluminum and then tried it out on the real thing. I drilled our two of the holes for the nutplate rivets with a #40 drill, countersunk the two holes, cleco’d the nutplate and then squeezed the rivets. Wow that was scary. But it worked out well. 1 hour. I installed 14 more nutplates. Only 225 more to go. 1 hour. I installed the rest of the nutplates on bottom of the left wing spar. I had my first screw-ups today: I squeezed a rivet without the nutplate in place and I squeezed two rivets that weren’t flush. So, three drilled out rivets. It wasn’t so bad. 1 hour. I installed the rest of the nutpates on the left wing spar. I still need to countersink for the screws on both sides. 1 hour. I installed the nutplates on one of the sides of the right wing spar. I only needed to drill out one mistake. 2 hours. I installed about half of the nutplates on the right wing spar. 1 hour. I have finished installing all of the nutplates to the wing spars. I had to drill out the last rivet since it’s a tight spot. I’m finally finished with the first two sentences of the Wing instructions. Two sentences! Now I need to countersink for the screws. 1 hour.